The Steel Oyster case measures 42mm and features an 18ct Gold screw down crown and which is water resistant 300 meters. It has a Self winding movement. The Blue dial features luminous maxi circular hour indices, date aperture at 3 O’clock. 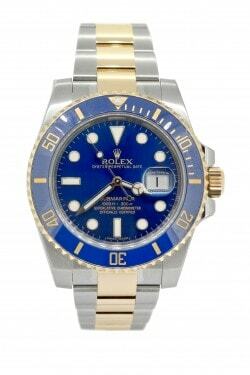 The watch has a steel and gold Rolex Oyster bracelet with folding clasp and glide lock extension. It comes complete with box and instruction booklets and a remainder of manufacturers warranty. UK Watch.